Trine is getting close to release, as proof by the recent demo and uptick in chatter on the game. But all isn't good with the Frozenbyte's game, not because of gameplay, but because of pricing. 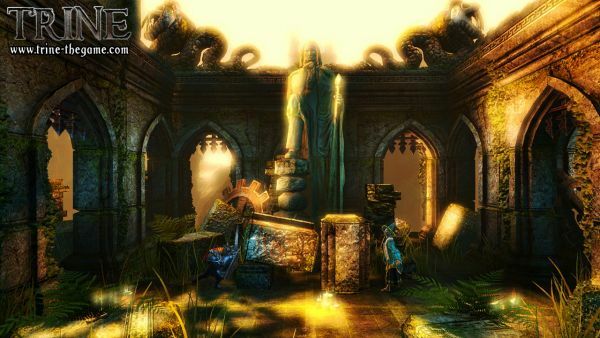 According to Shacknews, the PlayStation Network version of Trine will cost $20 - and while that initially might seem high for a downloadable title - keep in mind the PC Retail release is listed at $40. It should be noted that the PC and PSN version of the game have different publishers, with the PC version being published by Southpeak and the PSN version being published by Nobilis. Company employees came to the forums to defend the pricing, saying that - more or less - it's out of their control. "As for the PSN price, our publisher and Sony sets it," Lauri wrote in a subsequent post, later adding "heck, even I don't know it." "I just don't find it fair to compare us to games which have started at similar or higher pricepoints," Lauri concluded. "It's very obvious Trine will eventually cost less, so I guess I just wanted to say that if the price hurts more than waiting, then that's the option." It's never as cut and dry as it seems. But you can pick up the game for preorder on Steam for $30 - which doesn't seem AS bad. I will say after spending time with the demo I was ready to pony up the $30, regardless of the price on other platforms. And there's still the rumored Xbox Live Arcade release being published by yet another party, Atlus. Three publishers - three possible price points - three player co-op. Coincidence? Welcome to the wonderful world of gaming politics. Update: According to Destructoid, the official price of the game on the PC is $29.99 - not the $39.99 that Pre-Orders on Steam and other digital delivery services were claiming.